Here is a blanket I made for my Dad. I worked on it while I was traveling on my Kentucky trip a couple of months ago. My Dad is the strongest person I know. He has had cancer treatments in the past and he just gets up the next day and goes to work or goes to concerts with me. This is us at the Mannheim Steam Roller Concert.We went with my mom, the kids, Barry and my Aunt Liz and Uncle Tom. This is the second year we saw this event. Hmm I think we started a tradition. They played their usual songs and they also played some songs from Grinchmas. They also preformed a mini play with music and narration with some of the characters from the movie. The characters were not dressed up. It was well done. It was enjoyed by all. We also saw the Macy's parade at Universal and He treated everyone to Mythos. It is a resturant at Islands of Adventure. I will cherish these memories with my family for ever. As for my Dad, he is my hero and I may not always say it, but I love him and I am thankful for him every day. I love you Dad!! My next post is my 100th post I will be doing a Contest. Be on the look out for it!!! 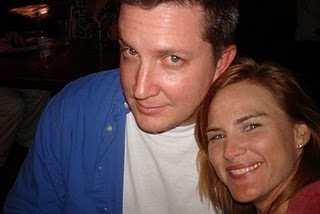 On February 3, 2001 I married an amazing man named Barry. He is my strength when I can't get up, my laughter when I need a pick me up, and confidant, yes he knows all my secretes and loves me anyway. Our first 3 years of marriage were really difficult. It wasn't because we couldn't get along, it was other things going on in our life that we couldn't control. Barry is my rock that kept me together through my darkest hours and continuously gave me support without asking for anything in return. He held me close to him and told me everything will be alright. As always, my husband is always right. (Except for maybe one time, but in 9 years of marriage that is pretty dang good.) We are going on into our TENTH year of marriage. It is very exciting. I wonder what adventures we will explore this year!! Kentucky will be the first for us to explore. I can't wait to explore our property up there!!! I can imagine digging up dinosaur bones or hidden treasure :) . I would travel the world with you Barry and love that I am with you through it all. For our anniversary Barry gave me a digital picture frame that has our wedding video on it. This video was on a VCR tape in our closet. He had it placed on a DVD. When I opened it and played the video I almost asphyxiated with joy and then he had our raw wedding footage on DVD as well. There is a story here. When American Idol came out we would record it on VCR when we couldn't watch it. Well one night Barry grabbed our wedding video and RECORDED over it. I was devastated. So the other part of my gift was the raw footage. As you could imagine I was in tears and couldn't stop hyperventilating. Barry was concerned as we were going into the restaurant to eat, he didn't want people to think he was beating me up, so as I cried I was smiling through out dinner. Thank you Barry, I love it!! And I have to thank my good friend Jimmy Sleeth for filming this video and all the time he spent putting the video together and saving the footage. It brings a huge smile to my face. Thanks Jimmy!!! After Dinner when went to see Phantom of the Opera. All the costumes were amazing!! I enjoyed them better than in the movie. They did amazing work. The singing and orchestra were fabulous. I recommend seeing this production if it comes your way. I really enjoyed it. It was a beautiful performance. The singing filled my heart with beautiful emotions I was in bliss.Thank you Barry for bringing this experience to me. You are the best husband in the entire world. 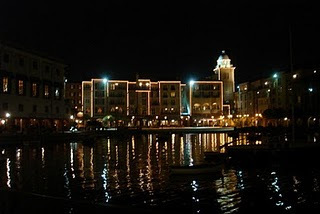 After Phantom we went to Portofino Bay Hotel in Orlando. We got on a boat after we checked in and went to City Walk. There is always something going on there. We went to Pat O Brian's. They have dueling pianos and Barry watched me sing songs and scream the night away. This was our view from our room. 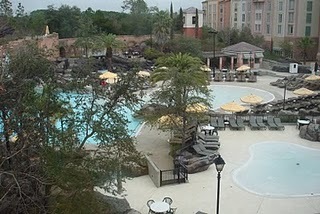 It was going to rain that day and it was cold, but the pool looked so good, I still wanted to swim in it. Thanks Mom and Dad for watching the kids!! Although we missed them dearly, we had a good time. Thank you Barry for our Anniversary plans I had a wonderful time. I love you with everything that I am and everything that we are together. I am at work with nothing else to do. So, I guess I'll just knit my mittens. I am watching the concert (Heart) and I have to wait until it is over to load out the equipment. I am knitting and watching the concert. I know it is hard to see, but I thought I would share a picture. She is singing the song Never. So much fun!! It's my nonblood related Best Friend Jill's purple hair!!! I say it this way to not ofend my blood related Best Friend and Twin Sister Cindy Story!!! 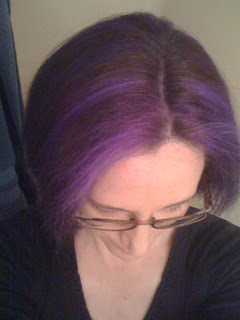 I had so much fun coloring Jill's hair purple. Her hair is beautiful and is also matching the freckles of purple on my floor!! I highly recomend placing something on the floor so that if a little bit of color falls to the floor it wont matter. It makes me smile to see the color on the floor, because I will remember all the laughter we shared through the entire process. Thanks Jill. I love your hair! !